Everyone hates mondays, myself included. Even something about the long awaited warm weather was wrong because, well, it’s Monday. After feeling so accomplished on my hill heavy run yesterday, I decided to go for it again. When I stepped outside it was (what felt like) 20 degrees hotter, and it made my run feel more like a death sentence! It’s amazing how just a change in temperature can so drastically change your pace and performance. Despite feeling like an overheated oven, I finished my run. When I got back all I wanted was something COLD. I remembered one of my recent smoothie pins and decided to give it a try since it had only a few ingredients and I needed something asap. The so called “Paleo Wendy’s Frosty” called for 3/4 cup coconut milk, 1/2 banana, 10 ice cubes, 1/2 tsp vanilla, and 1-2 tblsp unsweetened cocoa powder. I didn’t have a banana, so I decided since my chocolate protein powder is decently sweet it would have to do to replace the banana and the cocoa powder. I also added a handful of spinach because, why not? While I can’t say it tasted like a Frosty, per say, it was delicious. It was desserty, refreshing, easy, low cal, paleo, and poolside worthy. If this heat keeps up it will become a regular post workout snack. 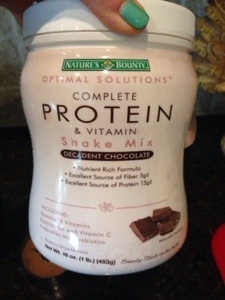 I use Nature’s Bounty Complete Protein and Vitamin Shake Mix. I love this protein powder because not only does it have a great flavor, but it also packs way more than just protein in two little scoops: 5g fiber, probiotics, enzymes (I will have to do a whole other post on why I love papaya enzyme), and tons of vitamins. Breakfast was leftover Banana Apple Crisp minus the coconut creme because I’m just lazy. I paired it with a couple links of Applegate Farms Natural Maple Chicken Sausage because last time the crisp left me feeling a little hungry since it’s pretty much just fruit. Lunch was a turkey burger atop some lettuce with the Maple Shallot Vinaigrette I previously made a big batch of. For dinner tonight I went vegetarian in an odd twist, and made portobello mushroom “pizzas” I guess you could call them. 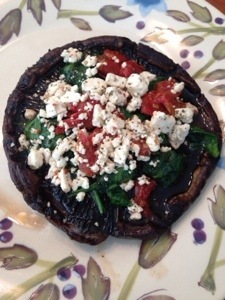 Basically I just grilled the large mushroom and topped it with some sautéed spinach, sun dried tomatoes, and goat cheese. So yummy and so easy! I also made a kale salad to go with it. This kale salad wasn’t as successful as my favorite kale salad recipe, probably because I didn’t follow a recipe… I started to, and then I just ended up adding all the things. I’m not saying it was bad because I definitely finished it off, but it definitely needs a few tweaks before I share the recipe. Your mushroom pizza looks really good. Grilled portabellos taste great. Thanks for mentioning my Maple Shallot Vinaigrette. I’m always happy to hear when someone has tried one of my recipes and likes it. Have a great week.